The best option for people wanting to play regular competitive Tennis is to sign on for Team Fixtures (graded weekly teams competition). 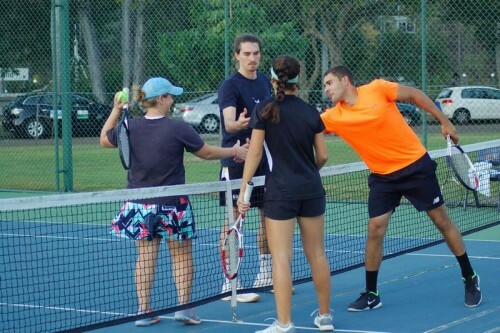 In First Semester, the UQ Tennis Club will be running three internal Fixtures (all matches at UQ) and entering teams in one Brisbane Night Tennis Association (BNTA) Fixture (matches at UQ and elsewhere in Brisbane). Check the 2019 Membership & First Semester Fixtures application form for competition details (dates, formats & fees). All new Fixture members must attend a Grading Session. There is no registration required for grading. Just turn up at and check in upstairs in the Clubhouse. Applications can be lodged on-line here. Before lodging an application, check the Team Selection Policies. Entrants can check their entries have been received and who else has entered here. N.B. Quotas apply for all Fixtures. Therefore, some competitions may fill up before the designated closing date for entries.